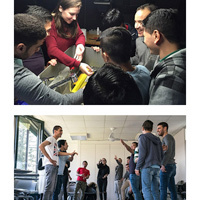 Students are meeting with refugees on a weekly basis near the Geneva campus. With more than a million migrants and refugees arriving in Europe in 2015 alone, and more than 150,000 in the first months of this year, the immigration crisis is continuing. More than 80 percent of these people are fleeing conflict and persecution in Syria, Iraq and Afghanistan. Webster students are doing their part to welcome refugees in Genthod-Bellevue, the area of Geneva where Webster's campus is based. The region currently hosting around 50 refugees and asylum seekers from these nations. In collaboration with the Bellevue community, the Webster Humanitarian Association (WHA) has established a weekly area where Webster Geneva students and the refugees meet to get to know each other, play games, sing and dance, learn about each others cultures and discover film photography. Activities include photography treasure huns, interacting in the classroom, learning to say "hello" in Pashtu, Arabic, French and Farsi and more. The Media and Communications department has equipped refugees with film cameras and taught them how to process negatives in the darkroom. There will be an exhibition of their photos that opens on the Geneva campus on Tuesday, April 26. Read about their story and see more photos at Webster Geneva.